Practice first grade addition word problems with three addends these math centers! They align with 1st grade Common Core standard 1.OA.2 for students to work on various story problems with 3 numbers. They consist of puzzles, task cards, and activities! They are designed for you to use in your math centers and rotations. 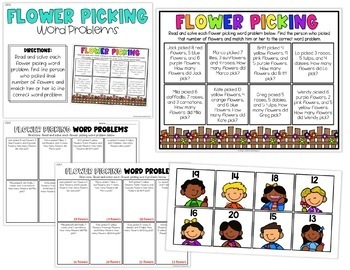 Flower Picking Word Problems: Students will read a flower picking word problem and match it to the person with the correct sum. 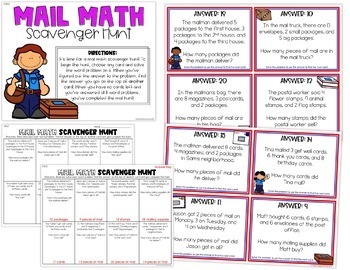 Mail Math Scavenger Hunt: In this task card activity, students will solve a mail-related word problem and find the next card by looking for the answer from the previous card. 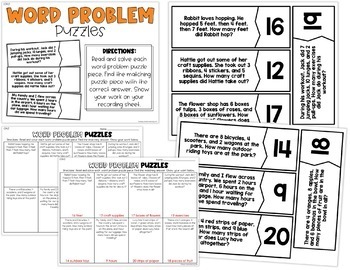 Word Problem Puzzles: Students will put together each word problem puzzle piece with the correct answer. 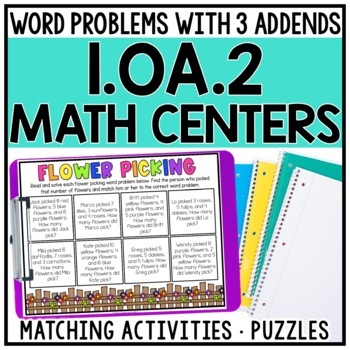 FYI: These centers are very similar to the 2nd Grade Measurement Word Problems. The activities are the similar but follow 1st grade standards for 3 addend word problems.